FRIDAY August 5 2011, the streets of Newport were lined with cars as people gathered for the Chambers Clan Reunion Registration night in Hotel Newport. 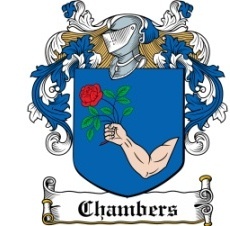 Groups of families walked the streets, meeting with relations and friends, every second person was a Chambers, related to, or a descendant of, a Chambers. There was a wonderful festive atmosphere around and that continued all over the week-end. That Friday night, as families from the United States, Canada, Great Britain, different part of Europe and last but not least, Ireland, proudly signed their names, met with relations, and forged new friendships, memories of times past, old homesteads, and family members, were all recalled, as people told their stories of old, some sad, some happy, but all very alive in everyone’s memory. And there were those who were not so sure of where their ancestors came from, but who received the necessary information from people like Peadar Kilroy, Peter Mullowney, Nancy Gallagher and Joe McDermott, all of whom have, through research and good memories, a wonderful knowledge of the history and background of most Chambers families..
One of the highlights of the week-end was the special Reunion Mass celebrated by Canon Eamon Concannon who had been parish priest in Burrishoole for twenty years. Before the celebration of Mass symbols were brought to, and placed before the altar representing the events and lifestyles of Chambers families. Candles representing countries where emigrating Chambers families settled, were placed on the altar, together with a special candle in memory of all deceased members of the Chambers clan. The family Crest or Coat of Arms together with the Chambers History and DVD, with stories and pictures collected from families all over, were placed as part of the display in front of the altar. A Passport and an old telegram symbolising emigrating families and announcing the safe arrival of a Chambers son, were placed alongside the Mass booklet and Rosary beads, symbols of the faith handed down from their ancestors. A sweater, made from the wool of the sheep, a lifestyle many Chambers families followed, was placed alongside an accordion and tin whistle symbolising the tradition of music and song among the families. Chambers Families participated fully in the Liturgy of the Mass from doing the Readings and Prayers of the Faithful, bringing up the Offertory Gifts, being Ministers of the Eucharist and all added to, by the beautiful singing from a choir made up of Chambers and extended Chambers family members, accompanied on the church organ by Mickie Walsh, now a grand-father to Chambers children. Traditional music was played during the processions by Julie Langan and Marie McHugh also descendants of the Chambers clan. After Mass, and with the sun beating down, people gathered on Main St where an array of Irish Crafts, and Irish home baking was on display. And as people queued to sample the pork from the Kelly’s Pig, roasted on the spit, they sampled home-made boxty, made by Gerard Chambers using an old recipe of his late mother’s, Nora Chambers (Brannen). The thatch cottage, assembled for the occasion, was visited by many as the traditional ‘wake’ was taking place inside. Cuilmore Comhaltas group, gave displays of traditional dancing, music, and song, adding a wonderful atmosphere to the whole event. The day concluded with the unveiling of a granite seat, presented to the town, to commemorate the Chambers Clan gathering in Newport. It was unveiled by Pete (Peter) Chambers Kilbride and Baby Chambers (Jock) O’Malley, two of the more senior members attending the Chambers Reunion. 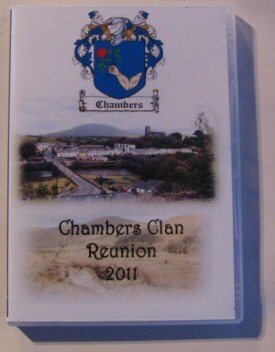 So whether you are still a ‘Chambers’ or an in-law, a cousin, or related in any way to a Chambers who hailed from places such as Shramore, Letterkeen, Treenbeg, Cloonfoher, Fauleens, Buckagh, Tiernaur, Rossavera, Drumlong, Glenamong, Cloggernaugh, Glenhest Derrycooldrim, or Newport, and attended the Chambers Clan Reunion in Newport this August 2011, you will have wonderful memories of family gatherings, moments to cherish and stories to pass on to younger generations and to those who were unable to attend the Reunion. 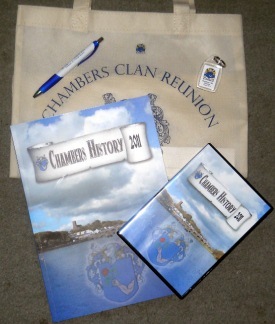 The Chambers Clan Reunion was a wonderful success, and this was brought about by a small hard-working and committed committee, as a result of a dream/ an idea that ‘it would be wonderful to bring all the Chambers’ back to their original homelands, and sure it couldn’t be too much work to organise it’ an idea mooted and put forward till all agreed by Margaret Chambers Mc Neela daughter of Annie and John Tom Chambers Cloggernaugh. And work she did, with the help of her committee, achieving her dream. Well done Margaret and all those who worked alongside her. It was a memorable weekend in Newport.